"A recent study showed that when doctors tell heart patients they will die if they don't change their habits, only one in seven will be able to follow through successfully. Desire and motivation aren't enough; even when it's literally a matter of life or death, the ability to change remains maddeningly elusive." A solid introduction to change theory. Includes multiple case studies, but I wish there were additional cases, or even a separate standalone version, with non-business applications. Part 3 focuses entirely on diagnosing and overcoming one's own immunities. "Were such advances just a matter of fate and random variation, completely out of our hands? Or could people actually be helped to grow? This took us further down our road, throughout the 1990s, and led us to a second discovery." "...the change challenges today's leaders and their subordinates face are not, for the most part, a problem of will. The problem is the inability to close the gap between what we genuinely, even passionately, want and what we are actually able to do. Closing this gap is a central learning problem of the twenty-first century." "Heifetz distinguishes between two kinds of change challenges, those he calls 'technical' and others he calls 'adaptive.'" Technical: known routine and processes. Adaptive: only met by transforming mindset; i.e., rewriting one's story. 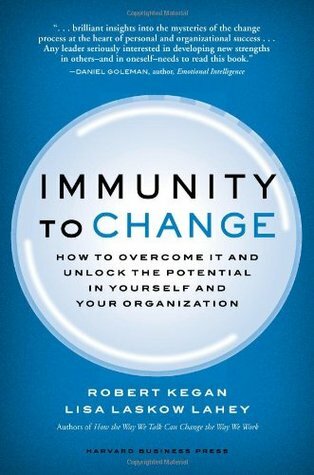 "But an immunity to change is also more than a system for self-protection." "Creating a picture of our immunity to change surfaces an optimal conflict." "Reasons tap into the 'ought' and 'should' realm of inner talk. We must also experience sufficient need or desire; visceral feelings--which is why we say they come from the gut." "Learning whether it is possible to think and feel that we can still be safe while pursuing a change is the essential change challenge." Sign into Goodreads to see if any of your friends have read Immunity to Change.